the brief / To create a new packaging line of cheese of our choosing. 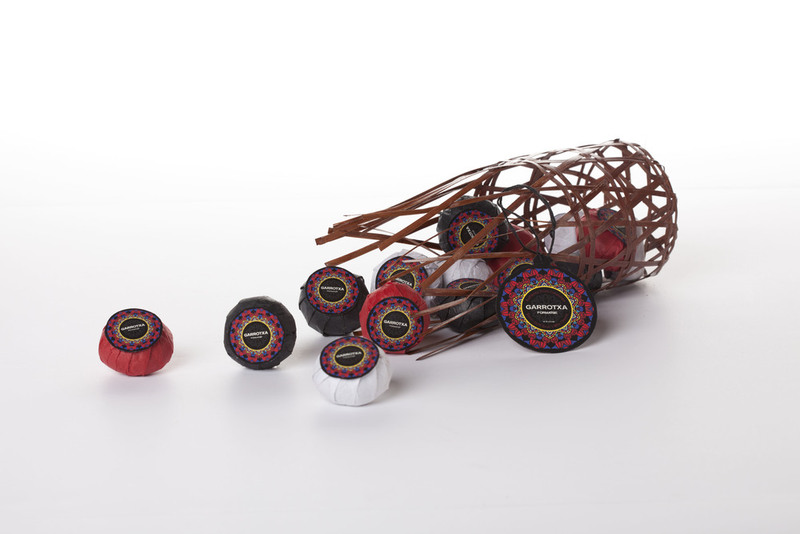 The food design project consisted of a minimum of one large round, a medium round cut into six wedges, ten mini rounds, and cheese packaging. the reveal / Since I am from Catalunya, I chose a specific cheese from the mountainous region of my country; the Garrotxa area. Garrotxa (also known as “pell florida,” meaning “bloomy rind” in the Catalan language,) is a traditional artisanal goat's milk cheese. It is aged in the humid Pyrenees caves in order to enhance mold development, and later on it is coated with ash which allows the development of its deep flavor. Knowing these unusual characteristics, I decided to produce a design that it was clearly Catalonian (reminiscent of stained windows in old churches) and used some darker colors, such as dark blue and black, in order to portray the idea of the caverns and the ash. awards & publications / Creative Quarterly Magazine 37, Packaging of the Word, 79nm.blog, Favourite Design.